Pulling together a memorial service or funeral program for a loved one can be an emotional task - one that many people find overwhelming when they're already dealing with a loss. 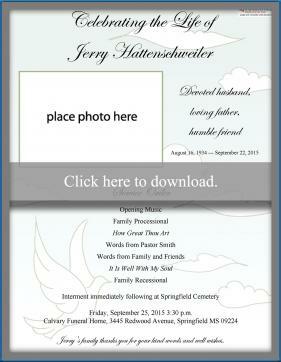 Use our free editable funeral program template for your program to simplify the process so you don't have to create one from scratch. 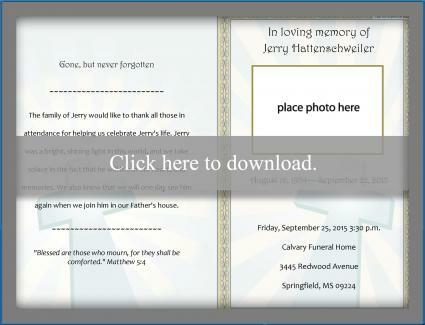 Click on the image above for a simple, one page, free funeral program layout. If you need help with these printables, check out these helpful tips. Note that the LoveToKnow logo will not appear on the printed programs. List the name of the deceased, taking care to double check the spelling before printing. Include a photo. Choose a photo that shows the individual in a familiar way; for example, if he was always joking, include a photo of him laughing and happy. To the right of the photo, customize the information to fit the deceased and include birth and death dates. Below this is the service order. In the example, songs are included, but decide if this is something you want included within the program. If the service is to be immediately followed by the burial, provide this information below. Below this, include the date and time of the actual funeral or service followed by a brief word of thanks from the family. If you would like a more formal, lengthier memorial service program sample, the template to the right consists of a two-sided, one page program which is meant to be folded into a four section program. This is also editable just like the simple program. Page 1: The first page starts with In loving memory of and is followed by a photo. Below this are the birth and death dates followed by the date and location of the service. Page 2: The second page features a biography of the deceased. This is where you provide highlights of the important aspects of the deceased's life. Use the example provided within the template as a guide. Page 3: The third page provides the service order. Page 4: The final page of the program is the family's opportunity to thank those who came to pay their respect. You can also add a comforting Bible verse or favorite saying. 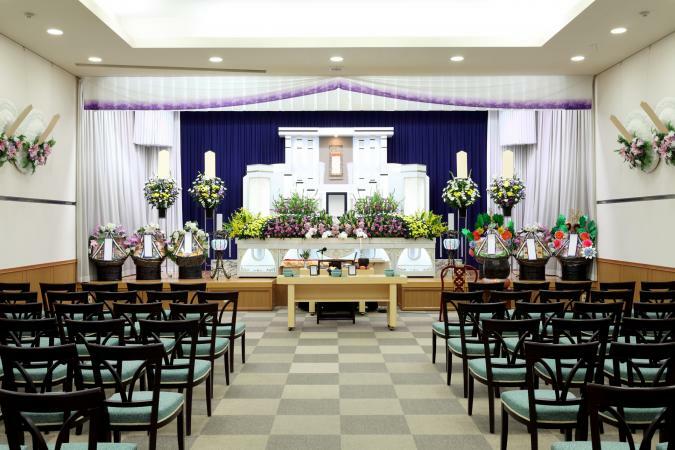 Funeral bulletins are distributed to those attending a funeral or memorial service and are meant to tell those in attendance what they can expect in the service, but they're also meant to honor the deceased. This is an opportunity to present a person in a final, honorable way. Many people save these programs to remember the deceased. Use these templates as guides to help you create a fitting tribute to the dearly departed. Add any other elements you see fit, considering what your loved one would have liked. Additional photos, lyrics, poems or even clip art from hobbies all help make these programs more special.